The leader in the The Economist last week was an article entitled ‘Morals and the Machine: teaching robots right from wrong’. As the title suggests, the piece considered the issue of morality in the context of ever-evolving technology – technology which is developing the ability to act and think for itself, and which is therefore inevitably progressing beyond the absolute control of human beings. Of course, the science fiction concept of machines going AWOL and turning against us is a concept that has long recurred in books and films from Frankenstein to The Terminator. It is doubtlessly a powerful idea, and one that penetrates deep into issues which have troubled humanity since we first started recording our thoughts in writing: creation, independence, the fear of the unknown, the fear of being displaced, and the distance between good and evil. As with most of science fiction’s central themes, the idea of man’s inventions running wild was dealt with in depth by H.G. Wells on the eve of the 20th century. 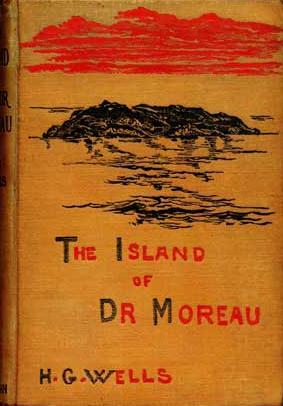 The Island of Doctor Moreau, first published in 1896, is a book that examines, with the same ruthless tenacity as the character of its title, the implications – moral, philosophical, and, unfortunately for Moreau himself, practical – of human beings tampering with the creation of life. Moreau’s creations are not of the robotic kind, but are instead animalistic monstrosities put together in the doctor’s ramshackle island surgery. Despite this, these experiments in vivisection reach an approximation of humanity, albeit a heavily distorted one, and as such display a primitive consciousness that inevitably leads to a questioning of their place as subservient beings. It is into this cauldron of strangeness that the narrator of the story, Prendick, is cast when he is shipwrecked on the island. The spectacle of deranged humanity with which he is confronted would be a lot to take for any man, but we get the impression from his account of the affair that he is not a particularly steely character, at least not before he arrives on the island. His nephew describes him as a “private gentleman”, and Wells suggests that he is essentially a man of leisure, travelling the world for want of anything better to do. As a result, Wells engineers a situation whereby a comfortable, refined upper-middle-class gentleman is cast headlong into a brutal realisation of what it means to be human. This juxtaposition is deeply satirical, and Wells forces Prendick into a close examination of the basic elements of morality, which, as a comfortable member of the “civilised” world, he has begun to take for granted. It is because of this that he is unable to happily reintegrate himself back into society once he is rescued: “I may have caught something of the natural wildness of my companions.” Prendick’s time spent on the island shatters his faith in the essential decency of human beings, and he becomes increasingly isolated, immersing himself in the study of astronomy as a means of distancing himself from the ugly truths which he cannot unlearn. Since the late 19th century, the Western world has become increasingly comfortable. Recent economic events, however, seem to have triggered a renewed interest in the consideration of morality, as we desperately seek to point the finger of blame. This sentiment is reinforced by a growing uncertainty about the future, and in particular about what new technology means in relation to basic questions of good and evil. After all, if we can’t decide these things for ourselves, what chance do we have of imparting any moral awareness to our robotic creations? In the context of this re-evaluation of the way we live our lives, and looking forward to how technology will challenge us, we could do a lot worse than to read or reread H.G. Wells’ tale of moral awakening.